After it became crystal clear that Arlen Specter didn’t have a shot at beating Pat Toomey in the GOP primary, Specter turned faster to the Democrats than Obama looking for his teleprompter at an impromptu event. I didn’t put a post up on Specter’s jump, because, honestly, it doesn’t matter much to me. Everyone knows I was going to do my damnedest for Pat no matter what no matter what Specter did. Pat is exactly what this state and this nation needs. I’m excited to be helping him in his bid for the Senate. However, I will find it very satisfying if Specter loses to Joe Sestak in the Democratic primary, it will be a slap in the face for both Specter, who somehow fees as if he’s entitled to seat in the Senate, and to Obama, who now has Specter following him around like a puppy dog. If I were a Pennsylvania Democrat, I’d be mighty angry at Obama and Specter for trying to impose their will upon me. However, I’m not a statist. I’m a fiscal conservative who wants this nation to return to capitalism, individual freedom, strong national defense, and the right to self determination. Pat’s a realist and he knows how to make things work, he’s practical, highly articulate, and extremely intelligent. He values individual rights and personal freedoms and he strongly believes in your right to make your own decisions in your personal life and to stop government from interfering. He will fight to reel in government spending, lower taxes, control inflation rates, help you keep more of what you earn, and lower the unemployment rate. Pat will be able to portray his positive message of growth and freedom and he will handily win the US Senate seat in 2010. In a very short period of time, Pat has closed a 20 point gap in the proposed general election race between himself and Specter. The gap is now at 9% between he and Specter and Pat hasn’t even started yet. Even before Pat announced, Specter was running TV ads attempting to smear Pat with false allegations. I am fortunate enough to have had Pat as my Congressmen for two terms and to follow him as a member of the Club for Growth. I had the opportunity to speak with him before and believe me when I tell you that he is a genuine person, very approachable, honest, and open. I also had the opportunity to hear him give a speech. His public speaking skills are impeccable. The Social Networking aspect on the site is great as well, so please register for that as well. Onward to Victory! Shocking, I know. Once again, our oblivious Governor is seeking to put Pennsylvania further in the red by proposing an ever larger spending package and the Pennsylvania Democrats are not being shy about how they want to fund it. They want to raise our personal income taxes. Democrats, both at the state and national level, seemingly have no concept of what budgeting means. Nor they understand the seriousness of the current economic situation, and how could they with the media currently covering Obama’s flank by painting the economic picture as somehow being rosy, even as unemployment skyrockets to near 10%. Recall a previous post about how Obama had set his bar so low, at that 10% number, that the media will paint his policies as success if unemployment does not exceed this shockingly high number as a success for him. Recall, too, how when unemployment had grown to nearly 5% under President George W. Bush how terrible the media made this out to be. It is unfathomable that the media would so obviously employ this double standard and bias. Yet, here we are. Back to the task at hand. The economic health of the Commonwealth was very strong under Governor Ridge, only to have Ed Rendell pile-drive the state into economic hardship and budget difficulties. Knowing what we know about the current state of the economy, Democrats now propose ever growing government spending programs to help “stimulate” the economy. So what was the excuse of expanding government spending in every other year? Democrats will always and forever want to grow the size of the government and intrude on your everyday life. They will never seek to downsize the government or cope with the realities of the real world. Knowing full well that unemployment can and sadly, will continue to rise, the projections are being made with the unemployment rates holding steady, with no way of knowing how many more people may lose their jobs or what the income range of each person affected will be. The only sure thing that can be counted on is that tax revenues will continue to fall no matter what the government does, and we can not and should not expect to take money from Federal taxes to pay for the incompetence and ignorance of Ed Rendell and Pennsylvania Democrats. They have been an absolute train wreck on our state and we are paying the price for it. Slashing the government budget and lower taxes will attract jobs and talented individuals to Pennsylvania. How, do you ask, would this happen? Simply, as other states, including Maryland and New York continue to raise taxes, people can and will move to jurisdictions with lower tax rates. Maryland knows this well as their “millionaire” tax has resulted in lower revenues as those affected have simply moved out of the state, and we’re starting to see that in New York. Businesses set up in areas where they are in an environment that allows for profits. Yes, that is truly how the Democrats think. Massive cuts or preparing a budget that meets the amount of money that is available cannot possibly fix anything, right? So how did we get into this “crisis”? By Democrats and Ed Rendell spending money that we don’t have on things we don’t need. How do they propose to fix it? By doing exactly the same thing, which just continues the downward spiral, and we’re left to pick up the tab and clean up the mess that they have created. Or at least left out of the White House. Though I suppose letting hundreds of children cry because Obama didn’t have the time for them or care that 6 year olds took a planned bus trip to the White House, and were full of excitement to visit, and were then turned away is probably some sort of grand metaphor for their reaction to the first paycheck they’ll ever get years from now under the Democrats tax and spend ambitions, this was just insane. I mean really. Look, I know a lot of people have touched on this issue, but I just want to make two points. First, do you really think the Pittsburgh Steelers players would have cared if they would have to stay late on their trip there, or wouldn’t have enjoyed, I don’t know, co-mingling with the young kids? Wouldn’t that have been great for those kids? 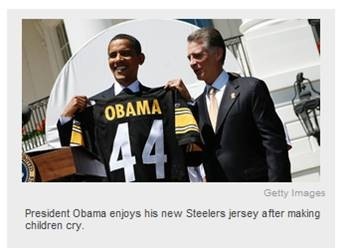 Meeting with the President and the Super Bowl Champion Pittsburgh Steelers? I know if I was a kid, that would have thought that was really cool. Do you think for a minute that Troy Polamalu wouldn’t have been rolling on the White House Lawn with a few of those kids? They would have had a blast. But, nah, let’s let them sit at the gate crying because, really, when is there ever traffic in the D.C. area? The second point I want to make about this was that even if Barack wasn’t able to meet with those kids, where was Michelle? Where was Oprah’s so called “greatest first lady ever” at? She’s even more over-rated and hyped up than Barack, and that’s no small feat. Though given their extremely liberal stance on abortion (rhetoric is one thing, but his voting record in the Illinois legislature and the US Senate are the real proof about how he feels on the issue) you’d think that since they had the the grand luck of actually leaving a womb they would have at least tried to accommodate the kids in some way. Even throwing them a bone in Biden would have been cool. They could have eaten ice cream together. The Obama’s only care about photo ops but I suppose TOTUS could only handle one event at a time, putting two prepared speeches on his plate at the same time would have probably caused him to crash, thus embarrassing his Press Secretary, Barack Obama. Oh well. But you know it’s bad when an NBC affiliate calls you out and provides the greatest photo captioning ever. I believe so strongly, as you may recall when I was here in October, not in you particularly but your generation, that I don’t have a single doubt in my mind we’re on the cusp not only of a new century but a new day for this country and the world. I’m sure the graduates at Wake Forest appreciate the fact that he doesn’t necessarily believe in them, but some people, somewhere. Also, I’d like to remind Joe that we’ve been well into a new century for a few years now. Let me, move, however, to my main point. After all that trash talking on the Tea Party movement, and grassroots efforts to point out the obvious, that flooding the market with dollars, endlessly running the printing presses at the Fed, passing unfathomably large spending bills, bailouts, and so forth, Obama finally admitted that we’re out of money. So I suppose when the media presents this, they’ll hail Obama’s honesty while they denigrated all those who warned of the dire consequences of Government spending run amok and the ill effects of such foolish policies. We scorned when we did so, and we here at To Our Republic in particular, have voiced strong concerns over the coming hyperinflation, which still has yet to be properly spoken about in the media as more devastating and an unseen tax that will punish American citizens of low and middle incomes. The deficit for the current budget year will rise by $89 billion to above $1.8 trillion — about four times the record set just last year. The unprecedented red ink flows from the deep recession, the Wall St. bailout, the cost of President Barack Obama’s economic stimulus bill, as well as a structural imbalance between what the government spends and what it takes in. Worrisome indeed. Consider also, we stand on the edge of losing our AAA credit rating as a nation due to the Liberal policies being embarked upon in this nation. I remember speaking to Marissa after the 2006 elections which saw the Democrats take over Congress, and saying, “How bad can they possibly make things in two or three years?” Well, I now have my answer, and I realize my own short sightedness. All we can do now is work vigilantly to warn against policies that will put America on course to economic ruin and to remind people of what the great Milton Friedman so eloquently presented, and which is undeniably true, that economic and political freedom are interlinked and equally dependant upon each other. We can not lose one and have the other, and that is why we will never fail to raise our voices and to fight for our causes.